There is no question that bridal customers make up a good portion of your clientele. They may start with purchasing an engagement ring, but with the right customer service, you can turn them into lifelong customers who return to you for all of their jewelry needs. But how can you reach out to potential bridal customers? Read on to learn more..
1) Search Engine Optimization: Search Engine Optimization is one of the most effective ways to help customers find you. SEO means helping search engines, like Google, find your website more easily using set keywords. SEO is necessary for all businesses and the jewelry industry is no exception. If you would like to know more about the impact that SEO can have on your business, read How a Good Jewelry Search Ranking Can Affect Your Business. 2) Instagram: Instagram is without a doubt one of the most popular social media platforms right now. It allows users to communicate by posting pictures, which includes brides. Using the right hashtags matched with professionally taken photographs, you can reach out to brides. There are many different hashtags to use, but it should pertain to the jewelry that is in the picture as well as linking it to the bridal industry. Fact: 71% of businesses use Instagram. 3) Facebook: Another type of social media platform is Facebook, which owns Instagram. Facebook is the most popular social media platform out there so to not use it would be a major disservice to your business. Your business can use Facebook in several different ways, including ads, joining bridal communities, and running a business page that you can share that shows off your products. Since Facebook owns Instagram, there is a lot of cross-over between the two platforms as far images go. Fact: Facebook has over 2 billion active daily users. 4) Facebook Ads: Facebook also has a business side of things, helping you create Facebook ads. Facebook has an algorithm that can make sure that your ads reach the customers that would be most interested in them. Many businesses are incredibly successful using these ads that are matched up perfectly to the users who would be most interested in coming into your business. Fact: 93% of marketers use Facebook regularly. 5) Pinterest: Many brides use this social media platform to create boards that contain ideas about their dream weddings, including pinning images of bridal jewelry. Pinterest also has the option now to link it directly to purchasing the jewelry. Show off your beautiful pieces that brides would like to remember, and their Pinterest pins will be seen in their feeds by other friends, allowing them to re-pin your products as well. Face: Pinterest has 250 million monthly users. 6) Make YouTube Videos: YouTube is a great way to reach a young audience. Make videos relating to your product and your business. Share tips for newly engaged brides,ring-shopping grooms, and gemology. Share the videos on other social media sites and keep your name out there. Avoid promotional content; focus on educational content. Respond to every legitimate comment; do not engage on negative or spam comments. Show high-resolution video of your inventory. Explain the 4 C’s. Explain trends in bridal jewelry. Share advice on shopping for a first-time bride. Share advice for shopping for a second-time bride. Fact: YouTube has over $1.5 billion users, making it the second-most used social media. 7) Your Website: Does your website appeal to the bridal shopper? You should ensure that your website has at least one page dedicated to weddings and bridal jewelry to show your potential customers what you have to offer them. You also need to make sure that your website is current and up-to-date. You website is the ultimate gateway to your business and will have a major effect on what customers think about you. Your website also needs to be mobile friendly, because the majority of millennials are more likely to look up your business using their smartphones. If they are frustrated by your website, they will leave it before they ever get to see it and know what an amazing business you have. The importance of your online presence cannot be underestimated. Learn the 5 Reasons Why Your Online Presence is Important. Fact: 92% of millennials own a smartphone. 8) Write Blog Articles:Share suggestions on bridal jewelry or tips that the bridal couple should know about shopping for the right ring.You should make a series of posts that appeal to brides that can help them along their journey. While helping them, you should show them everything that you have to offer. Blogging is one of the most effective ways to link up to people who many not even realize that they need to see the jewelry that your business sells. Fact: Blog articles with images get 94% more views. 9) Google My Business: Have you updated your Google My Business results? Google My Business is a free listing service that Google offers. Update it with specific information about your business, including business hours, website, and phone number, making it easier for customers to find you. Keeping this updated will ensure that brides looking for jewelry will have more accurate results and lead them into your store. You do need to be careful that someone else does not change the information on GMB, so checking on it regularly is a good idea. Read more about Google My Business Basics. Fact: 56% of businesses have not claimed their GMB listing. 10) Google Ads: Another one of Google’s services is Google Ads. This is a paid service that will put ads that are applicable to search results on a search screen for potential customers to find. It is an easy way to put your name out online and get more clicks to your website. Fact: For every $1 spent on Google AdWords, businesses receive $2 of revenue. 11) Email Campaigns:You can send out email campaigns that are bridal jewelry oriented to subscribers on your email list. 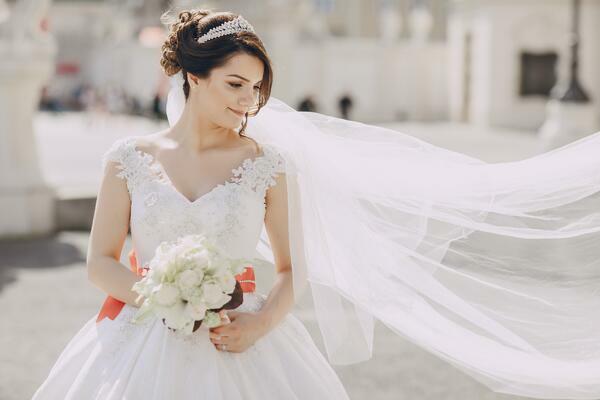 Even if not all of the people in the list are in the market for jewelry, you might be able to connect them to brides in their lives. Encourage people to sign up to your email newsletters through social media, further expanding your contact list. Learn how to Write the Perfect Email Subject Line, to fully make your email truly effective. Fact: Email marketing has an average ROI of 3,800%. 12) Bridal Conventions: The bridal and wedding market is huge and there is plenty of business for you to absorb. Get a booth or table at a wedding convention.You will expose your business to anew bridal audience. Collaborating with a partner in the space can help reduce costs and redundancies. Find speaking opportunities as a bridal jewelry expert to gain more valuable leadsthrough leadership exposure. Fact: 95% of marketers agree that live events provide attendees with a valuable opportunity to form in-person connections in an increasingly digital world. 13) Referral Promotions: Referral promotions are where you reward customers for bringing in their friends to your business. The reward is given once the customer who was referred completes their One option is to have different prize levels based on what the referred customers spend or by the amount of referrals a customer gives out. 14) Give Back to the Community: Social impact is a popular topic among the upcoming generation. Making a social impact is not only about donating money; it’s about showing you care for the community. Not only will you be doing good for your local community, you will join the conversation, leading to more involvement with your business and exposure to a broader audience. Helping the community will always work in your favor. People do business with people they like; and who doesn’t like a caring business? Fact: 70% of millennials will spend more with brands that support causes. 15) Get into Bridal Shops: Another great way that you can further your reach as far as a business-owner is to form strategic partnerships with other businesses in your industry and locale. Bridal shops present great partnership opportunities. Creating a referral partnership and building a long-term business relationship will help all businesses involved. Consider bridal photographers, caterers, wedding venues, etc. Fact: 60% of sales professionals say that collaborative selling has increased productivity by more than 25%. 16) Host a Contest:Use social media to your advantage. Host a contest or promotion, engaging your customer base and their friends and followers.Give the winner an enticing prize. Watch your social media presence grow and engage with your brand. Fact: 72% of millennials prefer to spend more money on experience-related purchases. 17) Reviews: How has your business been reviewed on Google or Yelp? Online reviews can make or break your business. Seeing four- and five-star reviews on a business listing builds trust with potential customers, increasing the likelihood of walk-ins and appointments. Avoid buying reviews because there could be backlash. Ask your customers about their experience. Upon further conversation, ask your happy customers to share their experience online. Yelp, Google, and Facebook are great channels for asking customers to post reviews. Fact: 84 Percent of People Trust Online Reviews As Much As Friends. 18) Social Media: You cannot be a shrinking violet when it comes to social media; be a shooting star. If you make posts on social media, they need to be engaging and interesting. Post often to keep your name out there and current. Social media is not something you can set and forget;stay active and grow your audience. Change up the type of posts that you make to keep your brand current and interesting. Keep up on all types of social media including, but not limited to, Facebook, Instagram, Snapchat, and Twitter.Our article, “The Secret to Using Social Media to Close the Sale” can also help you with social media basics. Learn the Top 5 Digital Marketing and Sales Trends in the Jewelry Industry. Fact: You should be posting on Facebook and Instagram daily. 19) eCommerce: Millennials are the most prominent generation of brides today; they will research a business and/or product online before committing to visiting a store. Being able to shop online and check out products online will make your business more accessible to the target market, showing the brand to be up-to-date. Learn How to Sell Jewelry to a Millennial. Fact: Ecommerce makes up 10% of retail sales and is growing by 15% a year. 20) Traditional Offline Marketing: Mailers still work. Digital marketing is usually less expensive than printed marketing and can reach a wider range of people; however traditional marketing tactics can still reach customer Read our blog article, Online vs Traditional Marketing to learn more. Fact:For every $167 spent of direct mail in the U.S., businesses sell $2095 in merchandise. 21) Your Storefront: What does your business look like right now? Have you remodeled recently?Is the brand current, fresh, and timeless? Depending on your location, ensure the aesthetic is congruent with your message. Your storefront may not require a complete remodel; check out the competing jewelry businesses and be honest with your assessment. Bring in an interior designer for an expert opinion. Fact: 90% of people will turn right when they enter your store. 22) Check out the Competition: Sometimes to know what you might not be doing right is to look at what your competitors are already doing right. We are not suggesting you copy them exactly. Take a look at what they are doing to draw bridal customers successfully. Take note of aesthetics, brand message, inventory, promotions, etc. Focus on the details and use it to your advantage. Fact: The top two process challenges that sales organizations face are meeting customer expectations and dealing with competitive concerns. 23) Expert Consultants: Sometimes we don’t know what we don’t know. Bringing in an expert can give us a fresh perspective. Consultants have worked with dozens or hundreds of businesses in your industry. Leverage their experience and knowledge to help attract more bridal customers and grow your business. There is a wealth of industry experts like GemFind that can assist with your growth goals. Fact: 88% of internet searches are for local businesses. GemFind can improve your search results.